FIG. 2. Illustrative serum LH and testosterone concentration profiles obtained in one young and one older man pretreated with leuprolide 3—4 weeks earlier to down-regulate endogenous gonadotropin secretion. 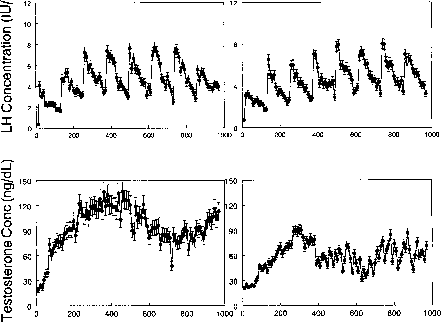 Data reflect 10 min blood sampling and eight consecutive intravenous pulses of recombinant human LH (50 IU, Serono) (Mulligan et al 2000). novel experimental regimen of physiologically i.v. pulsatile GH 'addback' for 2 weeks to test the GH dependence of hCG-stimulated Leydig-cell steroidogenesis in older men. This mechanistic consideration will be important to address definitively (Blackman 1987, degli Uberti et al 1997, Giustina & Veldhuis 1998, Haji et al 1980, Mulligan et al 1999a, Shah et al 1999b, Veldhuis 1996). Our pilot studies show that a pulsatile i.v. infusion of recombinant human (rh) GH every 90 min for 14 days (0.33 mg/kg/pulse) will restore 24 h serum GH concentration profiles, elevate plasma IGF1 concentrations and heighten 4 h mean Leydig-cell testosterone secretion stimulated by a single i.m. injection of 2000 IU hCG. In preliminary experiments designed to eliminate the use of the less physiological hCG stimulus, we have tested Leydig-cell responsiveness to pulsatile i.v. infusions of rh LH in 15 leuprolide-down-regulated young and older men (Mulligan et al 2000; Fig. 2). To improve study design further, we have shown that a single s.c. dose (2mg) of a gonadotropin-releasing hormone (GnRH) antagonist, ganirelix, lowers the serum testosterone concentration within 6 h by > 85% for 16—24 h in young men (T. Mulligan, A. Iranmanesh & J. D. Veldhuis, unpublished data). We earlier reported a comparably rapid time course of D-Nal-Glu GnRH's inhibitory actions in young men. Studies by Tenover et al (1990), also showed that young and older men manifest equivalent (age-independent) gonadal-axis suppression by a GnRH antagonist. Documenting GH-dependent enhancement of gonadotropin-supported Leydig-cell steroidogenesis in older men during controlled pulsatile LH drive would directly link hyposomatotropism with impaired testicular steroidogenesis in older men. To our knowledge, such a causal association would represent a novel finding in any ageing mammalian species. Conversely, we posit that androgen feedback on the GH axis enhances somatotropic activity. This thesis is discussed next from a general and then mechanistic perspective.